1 Armoured Division in Operation "Polo"
Synopsis: 'Operation Polo' was one of the first tests of the British-trained Indian Army after the vast new country obtained its independence from Britain in 1948. The eccentric Nizam of Hyderabad, feudal ruler of the eponymous state, refused to join India and proclaimed Hyderabad as independent. The Indian Government swiftly decided that it could not afford a breakaway state, backed by its rival Pakistan, to exist in central India, and sent in the Indian army to crush the nascent rebellion. This is the account of the subsequent 5-day September operation to annexe Hyderabad and subdue the Nizam's militia. The author, Major-General Chaudhuri, was the commander of the Operation which he admits was a Police action rather than a military campaign. Nonetheless it showed that India's new rulers meant business, and that their army could uphold the finest traditions of its British training. The code name 'Operation Polo' incidentally, was a reference to Hyderabad's role as the centre of Indian Polo - containing some 17 Polo grounds at the time where the game was played. 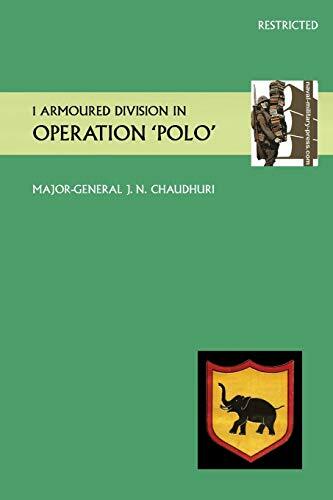 Title: 1 Armoured Division in Operation "Polo"
Chaudhuri, Obe Major General J. N.
5. 1 Armoured Division in Operation "Polo"
7. 1 ARMOURED DIVISION IN OPERATION "POLO"
8. 1 ARMOURED DIVISION IN OPERATION "POLO"
10. 1 Armoured Division in Operation "Polo"